How utterly charming is this ‘Secret Garden’ inspiration. If somebody could whisk me there right away to enjoy the beautiful glasshouse and floral scent of all the blooms I would be a very happy lady indeed. 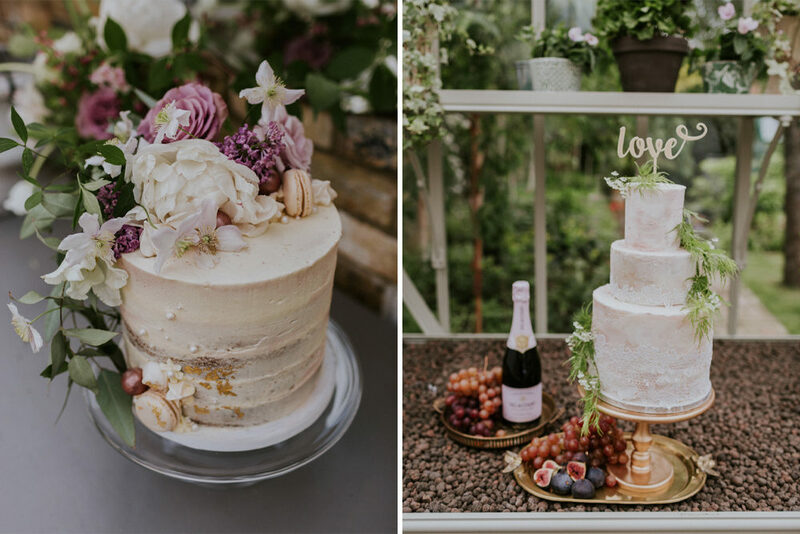 The ultra violet florals mixed with the lush greenery and crisp white looks divine, as do the elegant cakes and tablescape. Adding a touch of luxe is the gold cutlery and exquisite stationery designs by Mathilda Lundin, and I’m certain you’ve already pinned the epic flower installation already. Wowerweesers. Pretty like this, styled by The Timeless Stylist, and captured by Maja Tsolo is made for Fridays. 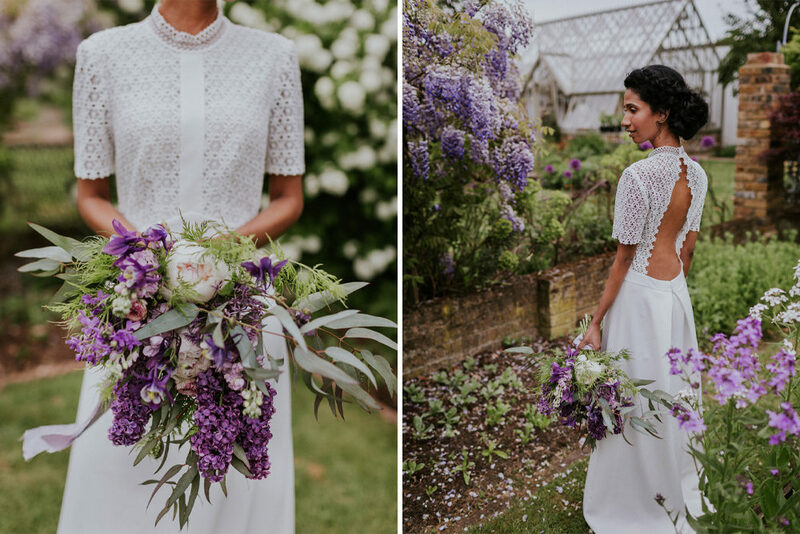 This English garden inspired bridal editorial celebrates the beauty of locally sourced, home-grown English flowers and foliage paired with a stunning setting of a glasshouse in a secret garden. 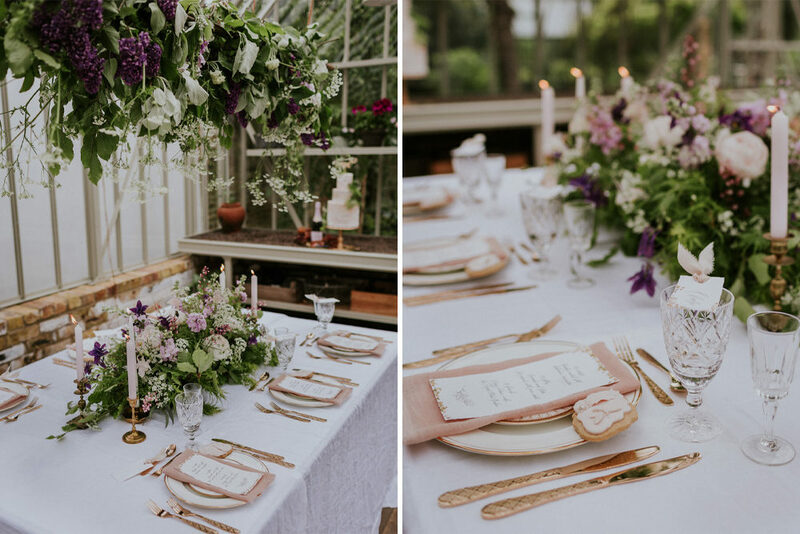 With seasonal blooms, naturally dyed linen, carefully selected vintage pieces and hand calligraphed menus, the tablescape is as beautiful as it is sustainable and would appeal to any bride who is looking to create a relaxed, romantic botanical setting for her wedding day. 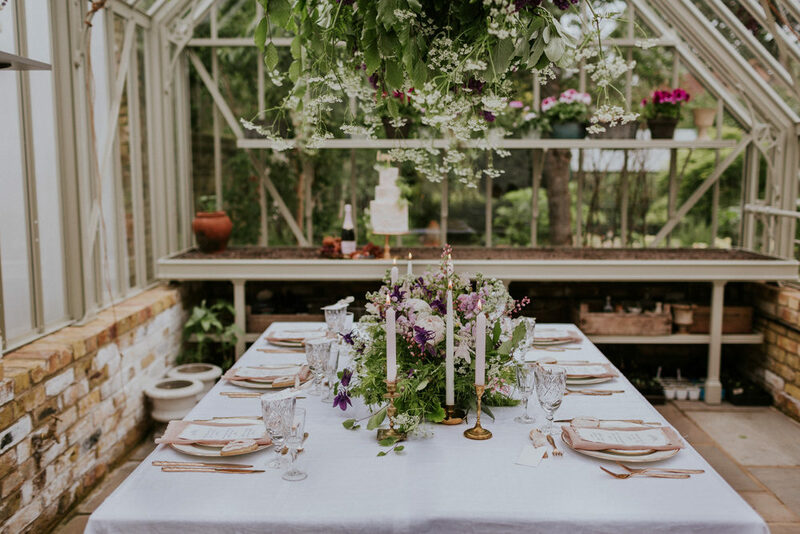 We wanted to show couples who are planning a more intimate wedding day, perhaps even in their own beautiful English garden, how to create a beautiful setting with delicate details and an abundance of seasonal flowers. 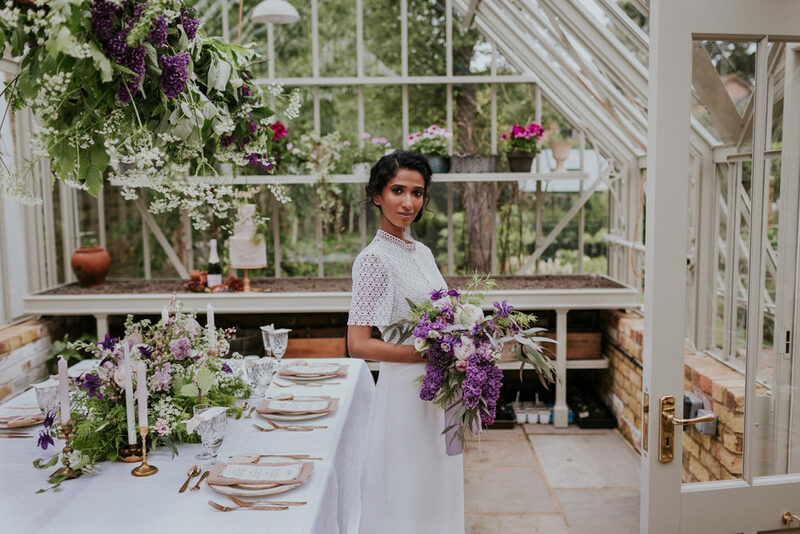 We took our inspiration from nature in the English garden and countryside and chose the magnificent flower garden and glasshouse of Nettlewood Flowers for our setting. 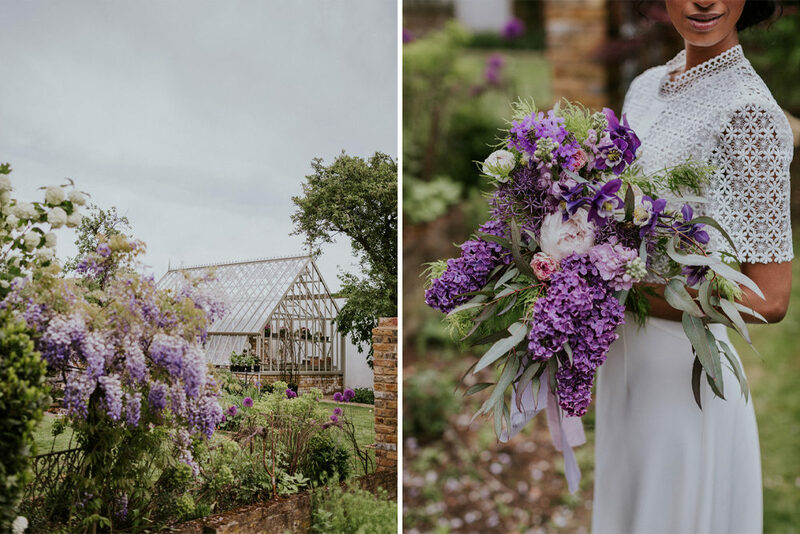 All flowers and foliage were sourced by Sarah of Nettlewood Flowers where possible and in season would all be available from her cutting garden or from other British flower farms. 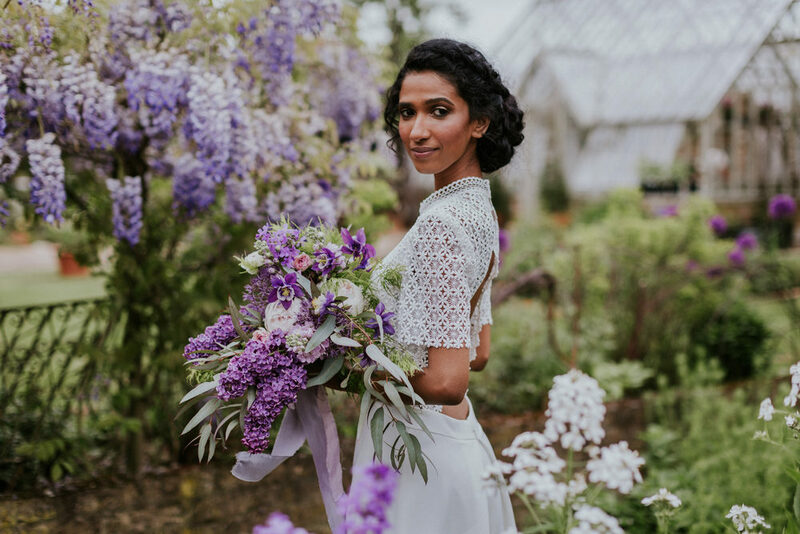 Lilacs and wisteria set the colour tone for the editorial and along with the green foliage they worked perfectly with the other gentle tones and textures. 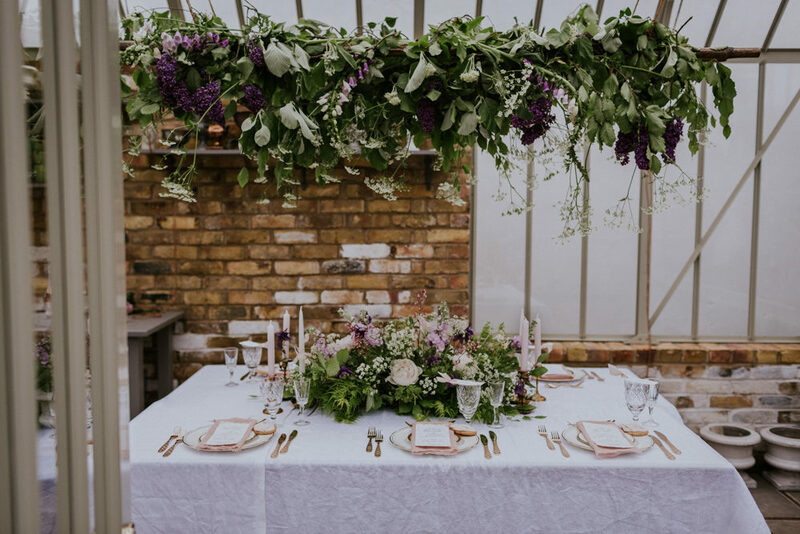 Sarah worked with another talented florist Leigh of Leigh Chappell Flowers to create the show stopping overhead installation above the table, the table centrepiece and the bridal bouquet. The flowers were combined with botanically dyed and hand torn sheer silk ribbons and linens in a tonal palette from Ros of The Natural Dye Works, which added beautiful, natural colour and texture. 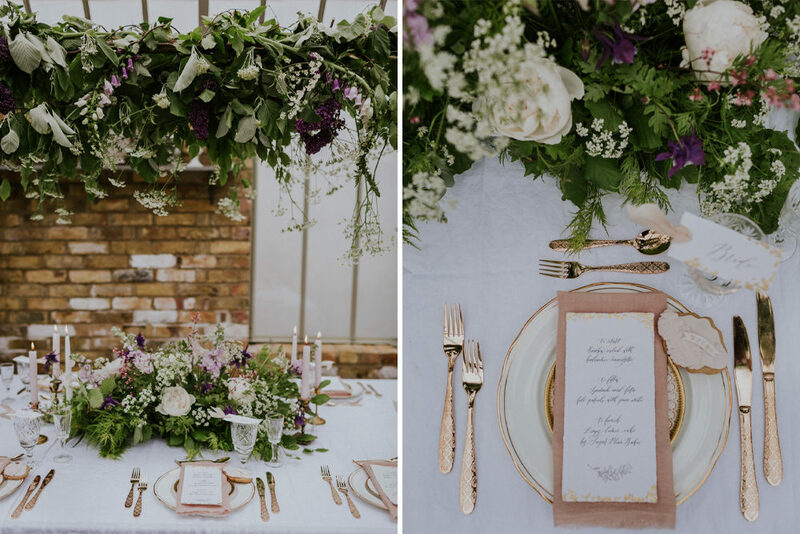 To complement the dreamy floral centrepiece, Mathilda designed bespoke calligraphy stationery with floral details, adding beautiful texture with deckle edge handmade paper and touches of gold leaf. 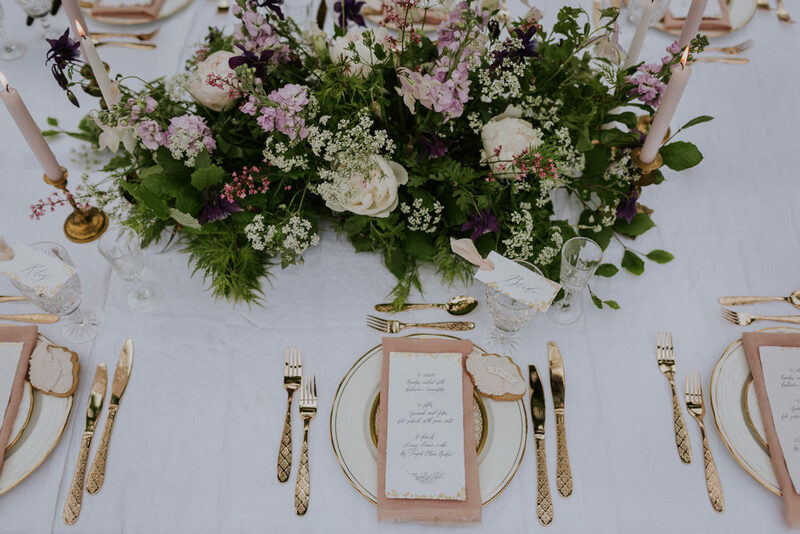 Amy of The Timeless Stylist lovingly styled the tablescape and brought the look together by continuing the gold details with vintage cutlery and gold-rimmed plates from her heirloom collection. She also chose brass candlesticks, hidden within the flowers, for a consistent and romantic look. Vaani of Sugar Plum Bakes added the final touch with her romantic cookie favours. Vaani also made the two sumptuous cakes on display. One was a three tier vanilla cake with textured buttercream highlighted by brushstrokes in blush and rose gold, finished with handmade edible lace. The second was a tall buttercream cake with chocolate truffles, mini meringues, macaron and touches of gold leaf. Both were adorned with flowers from Sarah’s garden. The model wore a Whistles Scarlett dress from their wedding collection, a simple yet sophisticated dress with a high neckline and a dramatic cut-out back detail. Make up artist Louise completed the look with a natural, English Rose make up and a soft braided updo. Maja of Maja Tsolo Photography photographed everything in her beautiful natural style of photography, focusing on the smallest details while also capturing the overall style and mood of the day.